How do we rate it? What condition is the road in? When should we fix it? “Which roads do we fix first?” How do we fix it? These are simple questions that may not necessarily have straightforward answers especially for a County agency that has one of the largest number of maintained miles in the State of California. The County of Los Angeles Public Works Department (Department) is responsible for managing and maintaining approximately 3,188 centerline miles (7400 lane miles) of paved roads. 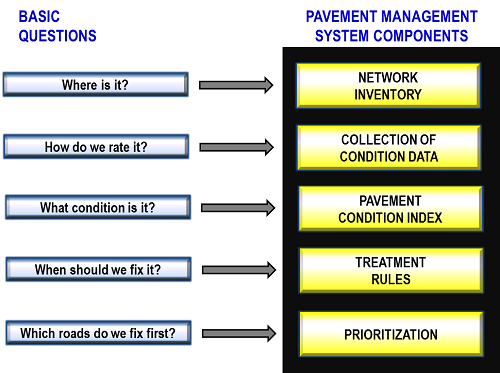 The Department is able to provide reliable and sound answers to these basic questions as a result of our systematic approach and use of a robust Pavement Management System (PMS), Stantec’s RoadMatrix V3.3. Not only does the Department have a large network, it is also a highly complex network due to large variations in geographical settings, climate conditions, functional road classifications, traffic volumes, soil conditions, pavement types and age. RoadMatrix is capable of handling the complexity of our network and can process a large amount of pavement data relatively quickly. The thematic GIS Maps in the RoadMatrix are also extremely useful in identifying and grouping projects, and we can literally see the “big picture.” The Department’s objective is to select appropriate and cost effective treatments for our roads as well as schedule these treatments in a timely manner. RoadMatrix stores the road location, the geometrics, the pavement structural data (i.e. AC thickness, base thickness, etc), and traffic data (i.e. Traffic Index, AADT) as part of the network inventory. The following is a description on how each of the components of RoadMatrix is used to help answer these fundamental questions. How Does the Department Rate it?Our first step is to obtain a network level assessment of the condition of all the County roads. To accomplish this, Department staff drives each road; carefully identifies the type, severity, and extent of the cracks or distresses on the road; and then documents the conditions. Photographs of representative road sections are also taken. This information is then entered into RoadMatrix which converts the data into a pavement condition index (PCI) on a scale from 0 to 100, with 100 being best. When Should We Fix it? Once the PCI is determined, the next question is “When should we fix it?” Our objective is to catch roads before they reach a condition level that would require a more costly treatment. Pavement performance models contained within RoadMatrix show how the PCI changes over the years. How fast the road deteriorates depends on the following factors: (1) type of pavement, (2) thickness of the pavement structure, (3) traffic volume, and (4) subgrade strength. 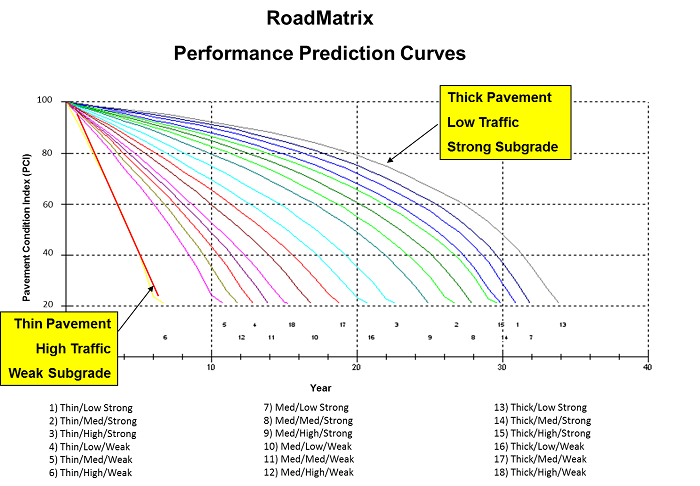 Using these factors, RoadMatrix, through Performance Prediction Curves (see graphic below) matches each County road to a pavement life cycle curve, which enables us to predict pavement condition at any time in the future. Using these curves, we set PCI thresholds consistent with the Department’s treatment strategies for preservation and rehabilitation. Our goals are to focus on keeping our good roads in good condition by utilizing pavement preservation treatments and to fix the roads that are on the verge of going to major rehabilitation or reconstruction. RoadMatrix is also able to quantify the Remaining Service Life (RSL) which estimates when the road will reach a PCI level for reconstruction. The models and triggers have assisted us in prioritizing, and scheduling preventive maintenance and rehabilitation treatments in a timely manner. How Do We Fix the Road? Once we know what condition the road is in and when we should fix it, the next question is, “How do we fix the road?” There are many factors that go into selecting a pavement treatment. 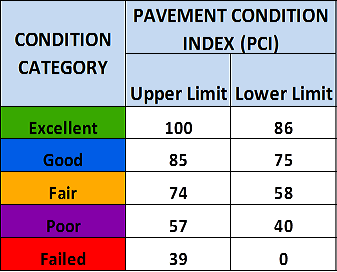 This table provides an example of the general treatment strategy based upon the range of pavement conditions. In RoadMatrix, the Department established its treatment protocols in decision trees which are logical flow charts with a series of “yes” and “no” answers to questions pertaining to pavement condition, cracking severity and extent, structural thickness, traffic conditions, etc., that lead to the appropriate and most cost effective treatment selection. RoadMatrix has the flexibility to address the complexities and variations of our road network. RoadMatrix enables us to customize the trees with our own criteria or protocol based our experience with treatments. For example, our experience has shown that Rubberized Asphalt Concrete (RAC) is a very cost effective treatment requiring little or no maintenance treatments for 12 years or more compared to conventional asphalt concrete when properly designed and constructed as a surface course on roads with high traffic volumes. Since the Department has traditionally taken the “worst first approach”, our tool box of treatments had limited preventative maintenance treatments. For the past couple of years, we have expanded our tool box to include more pavement preservation strategies such as polymer modified cape seals or scrub seals. We have also started performing sustainable treatments that focus on reusing the existing pavement such as Cold In-place Recycling and Cold Central Plant Recycling. Since RoadMatrix decision trees could easily be set up, we were able to incorporate best management practices for pavement preservation and sustainable approaches in our treatment selections. Which roads do we fix first? After the maintenance and rehabilitation decision tree analysis is complete, RoadMatrix calculates the benefit/cost ratio for each street. What-if scenarios are run to determine the optimal programs of preservation and rehabilitation for the network based on funding constraints and/or performance goals. RoadMatrix performs several iterations on each road to determine the optimal treatment and when to perform the treatment based on a cost effective approach. The results of these analyses are then used to develop work programs for planning and budget preparations. Once funding is secured, a project level study is conducted to further refine the scope of work and prepare construction contract bid packages. With drastic cuts in transportation funding and a growing backlog, the Department recognizes that it is not business as usual and that the challenges ahead to maintain our infrastructure will not be easy. We need to be more creative in the use of funds to get the most bang for our buck. The Department has embraced the preservation mantra - right treatment, on the right road, at the right time. We recognized that implementing pavement preservation strategies is key in maintaining the condition of our network cost effectively especially in these challenging times. To help us live up to this commitment, we have utilized our pavement management system to make better decisions, develop better groupings of projects, improve the allocations of limited funds, and improve the road network conditions cost effectively.